Our management team is always available to answer any questions you may have. In an effort not to take ourselves too seriously, Logan, Maverick and Max are frequently in the office. They inject fun and lightheartedness into our days and much needed breaks on stressful ones. We invite you to contact us at any time. Over the last 30 years, Bill has developed a deep understanding of the extrusion process. He started his career at Canandaigua Plastics in 1980, moved to the Nalge Company in 1983 and purchased Finger Lakes Extrusion in 1998. He is the go-to guy on difficult jobs where he offers great troubleshooting techniques and tips. Bill oversees the entire operation, enjoying his time on the production floor more than any minute in the office. If he isn’t in the office or on the production floor, he’s on the golf course. Erica is a 2006 graduate of SUNY Geneseo with a degree in Mathematics with a minor in Business Studies. After 4 years in Corporate America working as an actuary, she was looking for a change. 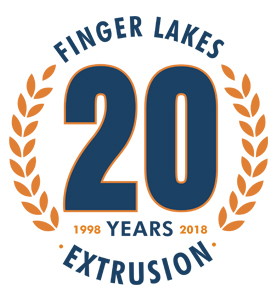 Finger Lakes Extrusion offered her that change and in 2009 she made the switch. Erica handles all finance and human resource functions at Finger Lakes Extrusion along with sales travel and quoting. All of these functions guarantee that no day is the same – her favorite characteristic of the job. Triathlons and lake life with her family are Erica’s most treasured moments. Phil has been a member of our team since 2009. Phil is a 2008 graduate of SUNY ESF with a degree in Conservation Biology. After gaining hands on experience on the extrusion lines during the summers of his college career, Phil decided that working at FLEX™ was better suited to him than a career in the environmental field. Phil handles all building and equipment maintenance and purchases. He is our resident outdoorsman, most passionate about white tail deer hunting and management. Keith has been a member of our team since 2007. With a degree in Business and a minor in Computer Science along with decades of mechanical experience, Keith brings a great deal of knowledge to the company. Keith coordinates all production activities and works with customers to help develop products that fit their needs. After years of racing stock cars and taking his motorcycle to track days, this busy Dad of two treasures the days when he gets to ride his motorcycle to work. Kathie has been a member of our team since 2013. She brought with her over 20 years of experience from various positions within the manufacturing industry. Kathie handles all inside sales functions and helps to manage our warehouse inventory. Her attention to detail and her desire to deliver a top notch customer service experience make her a key part of our team. Kathie enjoys time with her horse Cruiser, crafting anything under the sun, gardening and antiquing. Ted has been a member of our team since 2004. When Ted started at Finger Lakes Extrusion he came with over 15 years of customer service related experience. He led international customer service teams and won many awards for his skills. Ted continues to offer a great customer service experience by managing our customer accounts, assisting in sales functions and handling all freight issues. Ted is a lifelong athlete and adrenaline enthusiast – he’ll try anything once!